Since I’ve been blogging I have discovered many a great product that I probably would never have tried before I entered this crazy but wonderful world of make up and skincare! I have gone through my stash and picked out a small collection of favourites I’ve discovered from reading blogs! I cannot tell you how long this took me to choose just these and a second instalment at least is needed to share the mass amount of amazing products I’ve un earthed. Shu Uemura Eyelash Curlers – I’ve spoken about these and have reviewed them here so won’t go into detail again but what I will say is this – if you don’t have these, get them. They are seriously the best bit of kit your eyes will ever have! Topshop Sunbeam – This is probably the most perfect summer highlight. It’s golden tone give that beautiful sunkissed glow to your cheekbones and I adore it. The texture is amazing too, it feels like velvet! L’Occitane Almond Shower Oil – This first of all smells amazing! Second of all it’s so moisturising and turns into a lovely milky substance when the water touches it. It doesn’t leave your skin oily at all and is amazing for getting a close shave. 17 Mirror Shine Lipstick in Beehive – a super glossy version of Hue to me! It’s more comfortable to wear in my opinion too. I always favour a glossy product as I hate my lips feeling caked down so this gets top marks from me lipstick wise! The packaging could be better as the lid feels a bit flimsy and as though it could easily lose its shape. Bioderma H20 – UH-MAY-ZING. This is the single most amazing product from removing make up that Ive ever tried and my skin loves it!It’s a micellar water which is basically water with oils in it that break down your make up rather than smear it all over your face. Don’t be scared off by the mention of oils though, they don’t leave my skin oily at all. Revlon Lip Butters – These have been massively raved about in the blogging world and much deserved too! These are the perfect middle ground between a balm and a lipstick making them super wearable and the shades are gorgeous. Liz Earle Cleanse & Polish – This is my go to cleanser when my skin is really looking rubbish. I can always reply on this to get sort it out and get my skin feeling good again. The creamy texture makes it a great choice for sensitive skin types too. Dove Express Treatment Conditioner – Good old Dove, it’s always a brand I’ve been able to reply on and this conditioner is the best of the best in my opinion. I’ve never tried a conditioner quite as good as this one, usually any hair treatments leave my hair feeling really weighed down and greasy but this is super light but very nourishing. The smell is gorgeous and I just love everything about it really. Clarins Instant Light Lip Perfector – This has got to be the best lip balm in the whole world ever! I love how it makes my lips feel. I hate feeling heavy products on my lips so rarely wear gloss but this is a prefect consistency to add a nice natural gloss to the lips without feeling sticky or heavy. It really does make my lips look perfect! "Review: No7 Beautiful Skin Hydration Mask"
I've just purchased the Liz Earle cleanser after hearing so many rave reviews about it, I'm so pleased and only after a few days of using it, I've definitely noticed an improvement. Next on the list is Bioderma! Great post! It's so true that it's easy to get swept away and want to buy everything you read a great review about! 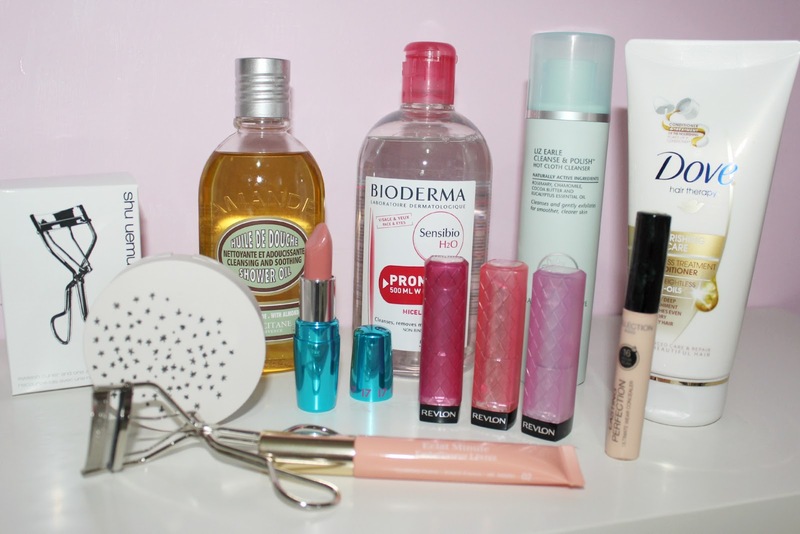 I definitely love the Lip Butters, and I'm dying to try the Bioderma! Am so going to try the L'occitane shower oil! Sounds perfect for my dry skin..